Ignyte Assurance PlatformTM is a leader in collaborative security and integrated GRC solutions for global corporations. For corporate risk and compliance officers who depend heavily on the protection of their resources, Ignyte is the ultimate translation engine for simplifying compliance across regulations, standards and guidelines. Headquartered in Dublin, Ireland, VigiTrust is a GRC (Governance, Risk, and Compliance) SaaS service provider enabling organisations to achieve, maintain and continuously monitor compliance with industry standards & laws such as PCI DSS, Vendor Risk Management, Third Party Assurance, EU GDPR, HIPAA, ISO 27001 etc. Importantly, VigiTrust’s Award Winning GRC offering also includes eLearning programs and prides a portfolio of over 50+ titles on Cyber Security and Industry Standards. IT Governance is a leading global provider of IT GRC solutions, with a special focus on cyber security, data protection and ISO 27001 implementation. We have helped firms of all sizes, across multiple locations, achieve their information security objectives through a mixture of tools, training, consultancy and penetration testing, with affordable custom and fixed-price solutions. In an increasingly punitive and privacy-focused business environment, we are committed to helping businesses protect themselves and their customers from the perpetually evolving range of cyber threats. Our Protect - Comply - Thrive approach is aimed at helping your organization achieve cyber resilience in the face of constant change. The EU General Data Protection Regulation (GDPR) comes into force in May 2018, and will apply to any US organization that sells goods and services to EU residents. Get trained by experts on the Regulation and how it applies to your business. 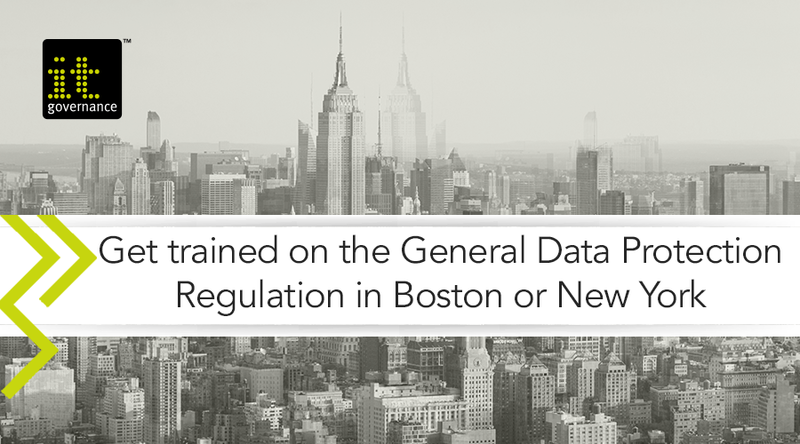 Our training courses are available Live Online, or in classrooms in Boston or New York. IT Governance, a leading provider of information security and data protection training and consultancy services, is delighted to announce the launch of a new and improved Certified EU General Data Protection Regulation (GDPR) Practitioner Distance Learning Training Course. The course aims to teach individuals how to implement and achieve full compliance with the Regulation, and fulfill the data protection officer (DPO) role. Red Clover Advisors is a data privacy consultancy that assists companies with GDPR compliance, operationalizing privacy, digital governance, and online data strategy. January 28 of every year is Data Privacy Day, where companies around the globe gear up for educating their employees on the importance of privacy and security. Jodie Daniels, Founder of Red Clover Advisors, suggests that we consider extending the knowledge and importance generated on this day into the other 364 days of the year. GDPR is a complex regulation comprised of 99 articles. In this 3 part series, we’ll break down the components of GDPR starting with an overview of the regulation and why you need to start preparing now. Part 2 will discuss some of the key elements including obtaining valid consent, online data technologies, privacy notices and cross border transfer. Part 3 will dive deeper into understanding the obligations of a Data Controller and Data Processors, individual rights, and the 72 hour data breach notification requirement.